Today is the last day of school for my boys and summer is almost here. With four boys to keep occupied by myself all summer and with me being 8 months pregnant, this summer is going to be interesting to say the least. One of the most dreaded phrases that my boys utter all summer and I am sure other kids do as well is "I'm bored." You know, the same phrase you hear after you have just done crafts with them, taken them to the park and watched a movie together. The same phrase that they will manage to spit out even though they are sitting in a room surrounded by toys that they just got for Christmas and there is a perfectly good pool outside. Want to put an end to it? 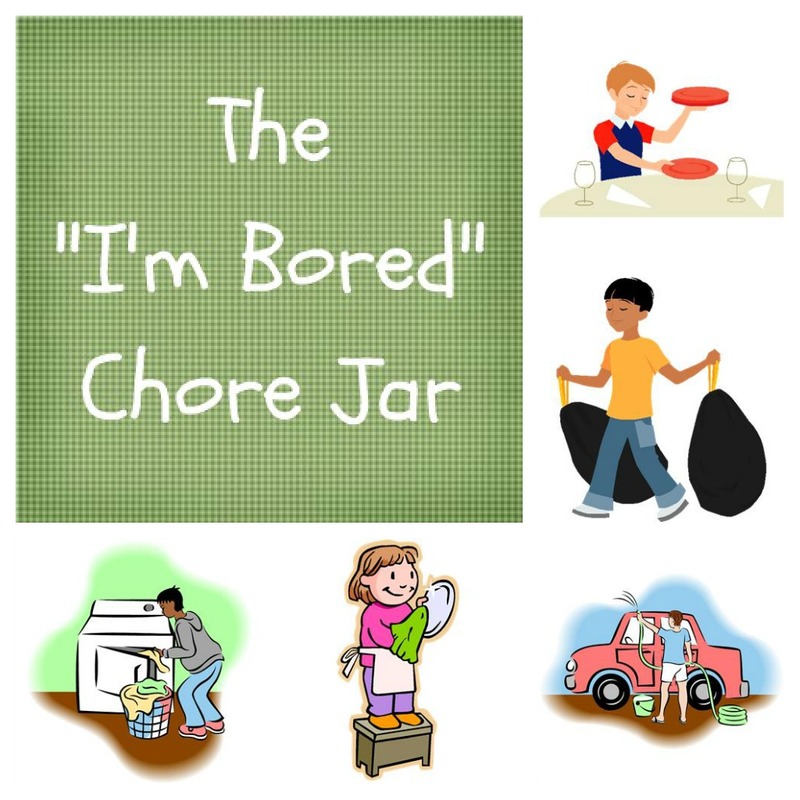 Now you can, with the "I'm bored" chore jar. Trust me, it works like a charm and the worst case scenario is that you will have a clean house. Take an old jar, container, etc. and decorate it all pretty like. Be sure to label it the "I'm Bored Chore Jar." This is particularly effective with children who can read! You can use the graphic above if you like. Write individual chores on wooden craft sticks. This can be something as simple as picking up all the dirty clothes around the house, dusting, or you can add in some harder chores like cleaning the bathroom or pet cage. When your child comes up and says "I'm Bored," refer them to the chore jar to pick a stick. I guarantee you that magically kids will find a way to be un-bored after the first stick or so. Or, they will be like some of my boys, find it fun and do chores all summer. See? It's a win win situation and all it cost you was an old jar and some wooden sticks. What are some of your summertime sanity savers? Wow, I'm so using this! I love it! I'm doing this too! What a wonderful idea! When my son is old enough I will do this with him!! THank you! I am so totally stealing this awesome idea! LOL! I just thought I should make one! Best idea ever? I think so!! I use something like this for my classroom when students finish their work early. This is a cute idea-- my daughter would never go for it though, lol. LOL Zippy. You could always give it a try! CarleM, it has worked really well so far. I had my youngest say he was bored the other morning. My oldest explained the chore jar to him and all I heard from the other room was "Oh no, I am not bored at all now." Since then, no one has been bored LOL. I love this idea! We have been on summer break for just under 5 days and Ive already heard "Im bored" more times than I can count. We WILL be making one of these tomorrow morning! Such a great idea!! !